LTH Home > Chat > Shopping & Cooking > Quark, bitte! E.T.A. Hoffmann, one of the greatest and internationally most influential German writers, was also a highly accomplished musician and music critic, sketch-artist, jurist and drinker. Born on 24 January, 1776 in Königsberg, the chief city of East Prussia, Hoffmann has long been a hero of mine. To do him honour I am intending to celebrate his birthday this year by preparing a grand meal comprised wholly of traditional East Prussian dishes and featuring as the main course Königsberger Klopse. In addition, a variety of appropriate wines and beers will be consumed to excess in remembrance of Hoffmann's own appreciation of excess (see first citation below). For dessert, I hope to be able to make a Glumsfladen or perhaps a Glumstorte ohne Boden, which is to say a cheese tort made with Glumse or, as it is more widely known, Quark, the smooth, white, slightly sour light fresh cheese that is widely enjoyed across the Low Countries and northern Germany and beyond. Though I have come across small containers of good quality quark imported from Vermont for sale at Whole Foods, the tort recipe demands a rather large quantity of the substance. So then: Do any of you know of a place that sells good quality quark in large quantities and at a reasonable price? Perhaps one of the Polish delicatessens? Alle Nerven excitiert von dem gewürzten Wein -- Anwandlung von TodesAhndungen -- DoppeltGänger. Last edited by Antonius on November 27th, 2005, 9:48 pm, edited 1 time in total. This isn't the solution you were seeking, but quark is ridiculously easy to make. Quark, Sahnequark, and Magerquark (Schichtkase) can all be made with just milk, buttermilk starter, and optionally cream. The only special equipment needed is a colander lined with butter muslin. 24 hours at room temp to set and then another 24 hours for the curds to drain in the fridge. 1 gallon of milk yields a little over 1 pound. Mine frau makes a killer appfel kuchen and never has a problem finding quark at Han's Delicatessen Meyer. For the 24th I don't think I have enough time to get things together and make my own but I definitely am interested in knowing more about how you do it and trying doing it some time on my own. You make your own mozzarella too, if I remember correctly, so you seem to be a pretty trustworthy source for cheese making tips. Any further info you can offer will be greatly appreciated. It's kind of far for me but I always enjoy immensely every visit to Meyers and enjoy the subsequent meals of pork products just as much. Last edited by Antonius on November 27th, 2005, 9:45 pm, edited 1 time in total. Several years ago, as a favor to a quark-deprived German friend, I searched Chicago for quark. It seems only two brands are available, the one from Vermont you have seen at Whole Foods and another from Appel Farms in Washington that's available at Delicatessen Meyer. Be sure to get the full-fat version and check the package date (the quark at Meyer's isn't always as fresh as it should be). My friend was fairly happy with the stuff from Appel Farms even though she always referred to it as pseudoquark. Most of the related fresh cheese I've seen at Polish shops is the drier 'farmer's cheese.' The pastries you're considering sound very good and I look forward to hearing how it turns out. Antonius wrote: Any further info you can offer will be greatly appreciated. If you have never made cheese before, you will be surprised how easy it is to create fabulous cheese, especially soft, fresh cheeses like quark, queso fresco, mozzarella, ricotta, creme fraiche, mascarpone, kefir, etc. I highly recommend a book by Ricki Carroll, "Home Cheese Making". Her company, New England Cheese Making Supply Company, has a web site: http://www.cheesemaking.com where you can order the book and also get most of the supplies you will need. Her book is good for the beginner, but you would want more advanced references if you advance to aged hard cheeses and bacteria/mold-ripened cheeses. The best tip I can give you is regarding sources of milk for cow's milk cheese. I have been using the "creamline" unhomogenized milk from Trader Joes. The new ultrapasturized brands (e.g. Horizon Organic) should be avoided. Happy to help if you have any questions. Due to circumstances beyond our control, it was not possible to celebrate E.T.A. Hoffmann's birthday with the originally planned Königsberger feast of Klopse and Glumstorte on the birthday itself, 24 January. We therefore decided to extend the celebrations over the course of the entire week, starting with a simpler but nonetheless festive meal on the 24th, and reserve the Königsberger specialties for an evening when time would permit their preparation. The week of festivities began with a quick trip to Meyer's Delicatessen in Lincoln Square on Monday afternoon, where we got several cold cuts, cheese, two kinds of sausage, potato salad, beer, wine, rolls, bread and, crucially, Glumse, a.k.a. Quark. That evening, we had a meal of Stullen (=Butterbrot) with the cheese (young Gouda) and cold cuts, which were Schweinebauch, Schwarzwälder Schinken, Tiroler Schinken and Pfefferwurst, accompanied by the potato salad from Meyer's, and preceded by a bowl of simply made lentil soup. After a brief break from the Hoffmann celebrations on Tuesday (though I'm sure he would have approved of the pasta e fasulë we had), we then had on Wednesday veal Bratwürste from Meyer's with Bratkartoffeln and spinach. Finally, last night the opportunity arose to make the Königsberger specialties. 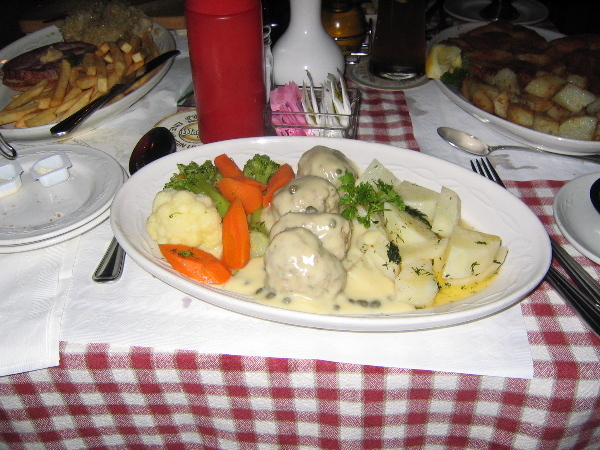 Briefly Königsberger Klopse are delicately seasoned 'quenelles' of meat which are poached in broth and then served with a sour or sweet and sour sauce that is made with the poaching liquid. There are many divergent recipes for the dish and the points of difference involve almost every aspect of the preparation other than the general cooking method. Nevertheless, one can discern in these recipes a core group in which the variation falls within certain bounds, a full discussion of which would be worthwhile but due to time constraints cannot be taken up here and now. Our approach to making Königsberger Klopse falls, I believe, well within the core group of recipes. For the Klopse themselves we use both veal and pork, bread, onion, lemon rind, anchovies and mace, and they gain additional flavour from the poaching broth, which is seasoned with onion, pepper corns, allspice and bay leaf. For the sauce we opt for the sour rather than sweet and sour variant. The sauce is made, as mentioned above, with the meat broth used for poaching the Klopse, thickened with a roux, then flavoured with lemon juice and capers, further thickened off-heat with egg yolks and finished with a good dose of Schmant, that is, sour cream. The Klopse are served with Salzkartoffeln, that is, small potatoes which are boiled, drained, salted and dried off-heat in the hot pan until they have a mealy texture. To my mind, the Klopse themselves are so delicate and delicious that I prefer to eat them with just the little bit of sauce that adheres to them after they are reheated in the finished sauce. But the sauce is also quite delicious in its own sour and intense way and goes perfectly with the simple Salzkartoffeln. As I said above, this dish is really quite sophisticated and it's very much worth the effort to make it at home. I should note too that Königsberger Klopse are also served as the daily special on Saturdays at Laschet's Inn on Irving Park, though I have yet to have the chance to try them there. Following John's (JSM) advice we bought our Glumse, the East Prussian name for Quark, at Meye's. In essence, this dish is a crustless cheese pie which features the Glumse enriched with butter and egg yolks and a little Grieß (semolina) and flavoured with lemon rind and lemon juice and sugar. This was the first time we made this and Amata did pretty much all of the work; the result was excellent. We hope to be able to post a picture of the Glumstorte soon. A final toast to the great E.T.A. Hoffmann will be raised tonight or tomorrow when we have an Erbseneintopf auf Berliner Art, a one-pot meal made with yellow split-peas in the fashion of Berlin and using the left over Bratwürste, cut in small disks, to fortify the dish. Alsatian Riesling, Rhenish Gewürztraminer and beers of various strengths and from divers parts of Germany have accompanied these meals. Thanks to Bill, JSM and ReneG for Glumse advice. And i thought this was a post requesting help with desktop publishing software. Now I'm hungry. At least I'll be at the DANK haus Sunday and maybe grab a bite around there or Laschet's. I saw Quark for sale at the Clybourne Trader Joe's today. Antonius wrote: As I said above, this dish is really quite sophisticated and it's very much worth the effort to make it at home. I should note too that Königsberger Klopse are also served as the daily special on Saturdays at Laschet's Inn on Irving Park, though I have yet to have the chance to try them there. Saturday night, after I had digested a significant portion of our lunch of tostadas ceviche and tacos de mariscos I found myself dining with an old friend at Laschet's. Surprisingly, this must have been the first time I had ever been to Laschet's on a Saturday night, since I have no memory of Könisberger Klopse ever being an option that was open to me. I ordered the klopse and I was delighted. The dumplings are silky in texture, served in a thickened lemon-caper-butter sauce. They are paired with simple boiled potato cubes and steamed vegetables. This is an excellent, warming plate of food that paired well equally with a glass of the house gewurztraminer and a half-liter of Hofbrau Oktoberfest (I couldn't make up my mind). My only complaint about the dish is that the seasoning of the meat (which was all veal in this case) was lost in the thick, tangy sauce. I would have prefered more agressively-seasoned veal. Nevertheless, this minor quibble did not detract from my overall enjoyment of the meal (which was capped off with a shot of plum schnapps from our waiter). Laschet's offered a second special on Saturday night: braised veal shank served "osso bucco-style". I could not convince my dining partner to order it. For some strange reason, he eschews veal. I'll have to go back and get it on my own. I highly reccomend a Saturday night at Laschet's. Regarding your comment about the interaction of strong sauce and klopse, cf. my comments above. Königsberger Klopse, when well done, surely rank among the finest members of all meatballdom, and Laschet's does a fine job. Janz lecker bei Laschet's, vor allem mit der Musicke dabei... auch janz jut bei uns, aber dann ohne Musicke. Start getting ready for E.T.A. Hoffmann Day soon! You won't want to miss out on any of the fun! I'm so glad that this topic came back to life, since I'd not noticed it first time around. Here are some questions that I'd bet you could answer, Antonius! Once upon a time, long ago, I had a serious relationship with a young woman who lived in Essen-Werden, who was originally from Königsberg. Given her origins, and our mutual study/admiration of Kant, she determined that it would be a good idea if, every once in awhile, she gave unto me some food from that region. Needless to say, klopse were the first offering. But then, on an occasion much deeper into Autumn, she prepared me entirely too much grünkohl mit pinkel, a dish I dearly loved. What can you tell me about this dish? I gathered (my Deutsch was schrecklich, not to mention freuchtbar, at that time) that pinkel was/is a very special sausage indeed. But that was about what I got. Similarly, whence the dish? One of my Leibnizians from Hannover spoke glowingly of it, and put it around that it was *his* region's speciality. And finally, is what we can get in our markets as kale, grünkohl properly so called? Man, is that a heavy dish or what? Whoo-eey. But awfully good. PS. Loved the picture and the memories it stirred--thank you! I haven't seen it around here, but then I wasn't looking. I'll ask next time I'm at Meyer's delikatessen. This kind of sausage is or at least was popular all across the north of Germany; I'm not sure about how popular it was/is elsewhere, but it is thought of as a northern thing. It's also widely known as Grützwurst, thanks to the oats which are an essential ingredient, along with onion and pork, pork fat, bacon, spices; they're usually smoked. What did your friend serve with the Grünkohl and Pinkel? Kaßler? Speck? Salzkartoffel? Ah, thank God winter is almost here! Wurstzeit! Mach 's jut da unter den Franzosen! Thanks for the info. I'd had the (mis)idea in my head, somehow, that pinkelwurst had something to do with brains, but obviously not, given your remarks. Brains NOT in "bregenwurst"--it's only a mislaid Plattdeutsch label; but also, no brains these days in ANY wurst. For obvious reasons. Wonder where I got the brain impression in the first place?? Oats, most certainly in pinkel--which explains some of the flavors and textures I now remember. Good to know. Now, what I *remember* the Schöne Frau as serving as Beilegen was Persilsalzkartofflen--is that even possible? Maybe not, but that's what I remember. She was not big on Speck, altho' I convinced her, finally (and, I must admit, through the agency of her teen-aged son), that it was an essential ingredient in Geo's Weltbehrumpte Chilibohnen! Speck in the Ruhrgebiete was something else: almost purple-y dark in color, very very richly smoked. Yum. And yes, I most heartily second your welcome to Wurstzeit!! Had some wonderful Romanian mici on Saturday from a grill stand at Jean-Talon market. It was spitting snow and cold outside. Just absolutely perfect!! Geo wrote: Once upon a time, long ago, I had a serious relationship with a young woman who lived in Essen-Werden, who was originally from Königsberg. Given her origins, and our mutual study/admiration of Kant, she determined that it would be a good idea if, every once in awhile, she gave unto me some food from that region. Needless to say, klopse were the first offering. But then, on an occasion much deeper into Autumn, she prepared me entirely too much grünkohl mit pinkel, a dish I dearly loved. Antonius wrote: This kind of sausage is or at least was popular all across the north of Germany; I'm not sure about how popular it was/is elsewhere, but it is thought of as a northern thing. It's also widely known as Grützwurst, thanks to the oats which are an essential ingredient, along with onion and pork, pork fat, bacon, spices; they're usually smoked. Oh, and I've just mentioned this to TODG, who immediately responded: "There's OTHER things to eat in Lübeck, too!" Altho' she's not a sausage fan, she bakes considerable, so it's not a mystery what's she's talking about. If you get a chance, the pictures would be a delight, needless to say! Geo wrote: Oh, and I've just mentioned this to TODG, who immediately responded: "There's OTHER things to eat in Lübeck, too!" Yes, indeed. I ate extremely well there -- every meal was at least very good, several outstanding; lots of great fish. The Grützwurst I had was in the style of Rügen; the meal included a generous heap of delicious Bratkartoffeln*... un dat weer jo lecker. Due to the extreme cold, ETA Hoffmannstag celebrations have been extended from yesterday on through this coming Saturday. 1. Are these celebrations open to the public? The original post led me to believe that they were private: "To do him honour I am intending to celebrate his birthday this year by...."
2. Being a nicht geGerman sprecher, could you please getranslate the second line of your post? I am a relatively recent, though enthusiastic, convert to Hoffman's writings and this sounds like something worth further investigation. Hoffmannstag should be celebrated by each as he/she sees fit, either publicly, with the ingestion of prodigious amounts of (German) wine or beer in a suitable public house, or in the familiar privacy of one's own abode, perhaps sipping some Riesling or even a Bärenjäger or two as a member of the intimate gathering reads aloud from one of Hoffmann's masterpieces or with a cd of his music playing as background to a discussion of the great man's life and works. The second line of my post, loosely translated, says: "Belated Happy Hoffmannstag wishes! (And don't forget, they have Königsberger Klopse every Saturday at Laschet's!)" So, were one so inclined, one might take this all into consideration when making plans for tomorrow. I must confess that the last time I had the Klopse at Laschet's, the first (and only) time since the new owners took over, I was disappointed. They were not up to the old level of quality in my opinion. But that was about a year ago and it may very well have just been a bad night or an issue of the ownership transition (then in progress) which has since been put right. Alas, I have not been able to frequent my old haunt with the same regularity as I had in the couple of years preceding the transfer but the last few times I was there, things seemed to be for the most part very much on track. As this holiday, first popularised in these United States by the present writer, is a celebration of a great Prussian, be sure to include something distinctly Prussian in the festivities; Bavarian cuisine and Bavarian Gemütlichkeit certainly have their place in the yearly cycle, but not on Hoffmannstag. Bitte sehr, mein alter Freund! And greetings to all my fellow Prussians out there! one with buttermilk brought to room temperature, then warmed at 100 degrees for 8-9 hours or so until thickened. This is rather yogurtish or even creme fraiche without the cream. Another was sour or acididulated milk gently heated to separate the curds from the whey, then strained for 12 hours. This sounds like farmer's cheese. Anyone have experience making their own quark? I've always used culturesnand rennet in my cheesemaking. I've never made quark (it's in our supermarkets here as frommage frais), altho' I've eaten tons of it in Germany. Use: "Most of her recipes -- for buttermilk, mascarpone, creme fraiche (a thin sour cream) and quark (a soft fresh cheese) - take less than an hour to prepare." and according to WSJ, quark "comes from a German word meaning 'curds' and is not related to the subatomic particle called a quark, a name coined by Murray Gell-Mann, who originally pronounced it as 'quork.' (Seeing the word 'quark' in James Joyce's 'Finnegan's Wake' induced him to make the spelling change.)" And as you can surmise from the citation, the original source was an interesting article in the paper about the "craze" for making simple cheeses at home. I think the editors must be reading LTH Forum for story ideas! The only time I made cheese was accidentally when I was trying to make yogurt in a crockpot and got the mixture too warm (I think). The mixture "broke" into curds and whey. I did not know what I was doing all the way around. But I decided to dump the mixture through a cheesecloth-lined wire strainer, dumping the liquid whey down the sink drain. I hung the curds in a cheesecloth ball from the kitchen faucet overnight and the result was a wonderful slightly tangy cream cheese which I happily served my family without necessarily mentioning that it was from a failed experiment. Now, if that happened to me again, I would at least save the whey and refrigerate it. I have read that it is a very healthy drink. Great new source for quark! The Clock Shadow Creamery, 138 W. Bruce Street, Milwaukee 53204, which opened May, 2012, is making a very good version for $3.50 a ½ pound. They’ll sell it to you there, and in cool weather, will ship it to you. Nice flavor and firmer (but very creamy) texture than the Vermont Creamery version, which is soft as sour cream. I hope to try the quark from The Clock Shadow Creamery, which has Sunday hours. In my other life, milk was transported without refrigeration in the USSR. Purchasing milk on the cusp of spoilage was not uncommon. I learned from locals to rescue this situation by making tvork or farmers cheese. This involved adding a buttermilk-type product, too. Adding buttermilk to cream is also a method of making creme fraiche. I'm curious to make some quark, as stated in the link above, to try against some for The Clock Shadow Creamery.